The Koala Privy Berlin Bear 1 oz silver coin was issued in 2011 by the Perth Mint. 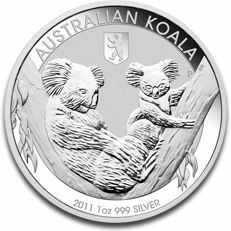 The Australian silver bullion series illustrating a koala started firstly in 2007. This Koala silver coin accompanied by the privy mark is a new addition to the series, the first one being released in 2011, and is the subject of this present article. This Australian silver bullion coin weighs 1 oz or 31.10 grams of silver. The Koala Privy Berlin Bear 1 oz silver coin is manufactured from 99.90% pure silver. Even though a small VAT is added to its price, it still remains an asset worthy of investment. Design for the silver bullion coins illustrating a koala is changing every year. Therefore, the design for the Koala Privy Berlin Bear 1 oz silver coin issued in 2011 coincides with the one for the regular silver coins issued in the same year, with a small difference. The obverse of the Koala Privy Berlin Bear 1 oz silver coin is a portrayal of Her Majesty facing right engraved by Ian Rank-Broadley. It is an effigy accompanied by the following inscriptions: ELIZABETH II, AUSTRALIA, and the face value of 1 DOLLAR. The reverse of the Koala Privy Berlin Bear 1 oz silver coin illustrates a resting adult koala together with a young koala that holds tight to a branch tree. Above this depiction is the image of a small Berlin bear which is a German symbol for its capital-city state. This is the Privy mark and the plus feature that makes this coin different from the other silver bullion. At the top is the AUSTRALIAN KOALA inscription and at the bottom the issuing year 2011, the weight 1 oz, and the fineness 999 SILVER. Even though is a special release by the Perth Mint bearing the Privy Berlin Bear on the tail side of the coin, the premium added to the Koala Privy Berlin Bear 1 oz silver coin minted in 2011 is a small one. Therefore, being priced in accordance with the evolution of the price for silver, this silver bullion coin is affordable to mass investors and numismatists. The Koala Privy Berlin Bear 1 oz silver coin has the bullion characteristics for which the Perth Mint is recognized all over the world. If we add to the 999 fineness and the beautiful design the scarce mintage, we obtain a bullion coin that will be in high demand in the future so it is a sure way for an investor to be profitable. The Koala Privy Berlin Bear 1 oz silver coin issued in 2011 can represent the start of a beautiful collection which can be accompanied by the release from 2012 with a totally different design. It will be not at all an expensive collection so there is no reason to miss it. Being such a limited edition minted only in 2011 and 2012, the Koala Privy Berlin Bear 1 oz silver coin is of immense interest for all collectors and investors and can be acquired from our website.